Get $20 for every friend you refer! We know it takes some time to explain the concept of GrabHitch and we want to reward you for your efforts. For every friend you refer, you will get $20 after your referee has completed 1 driver ride successfully as a new GrabHitch driver. On top of this, your friend will also get $20 in his/her driver wallet! All you have to do is to get your friend to sign up with YOUR Grab-registered mobile number OR your referral code, its that simple! This December, get guaranteed rewards when you invite 3 or more friends to join the driver community. In addition to the base $20 for $20 scheme, refer 3 or more drivers successfully to qualify for an additional $30 top-up to your driver wallet! And if you refer 5 or more drivers, you qualify for an additional $50 top-up! 1. Ask your friend to press the blue DRIVE button to start the sign up process. 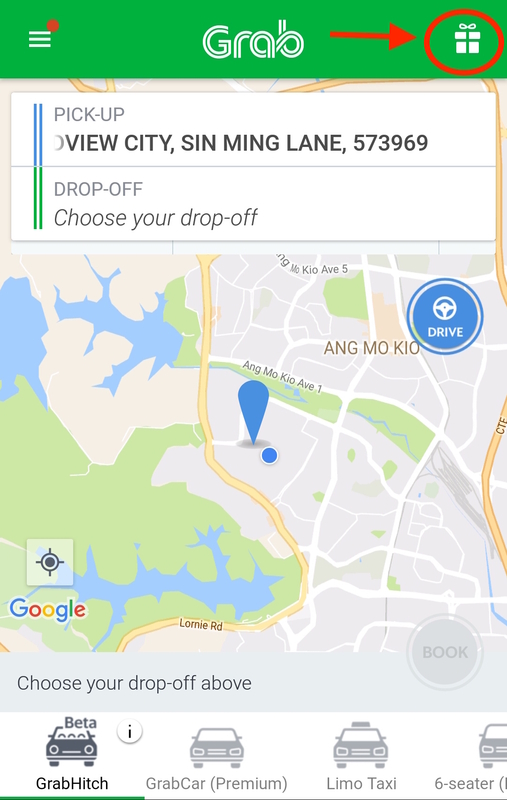 Select the Gift Box Icon circled in RED in your GrabHitch Passenger Screen. Click on the MORE (…) Icon. 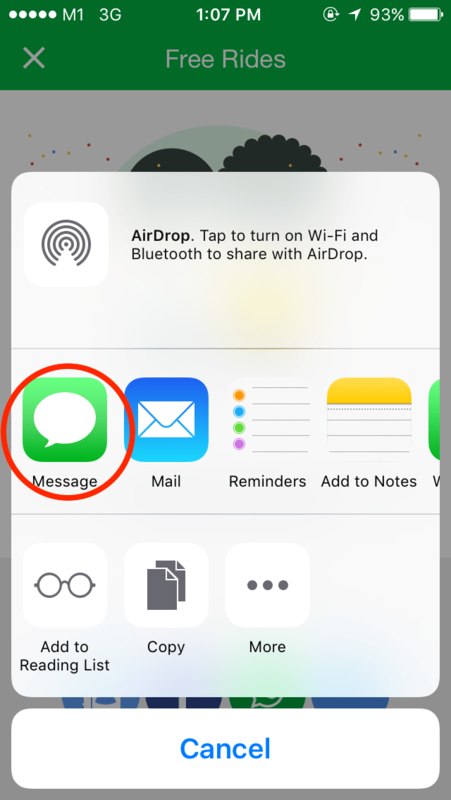 Select Message and a link should appear in the text message field. 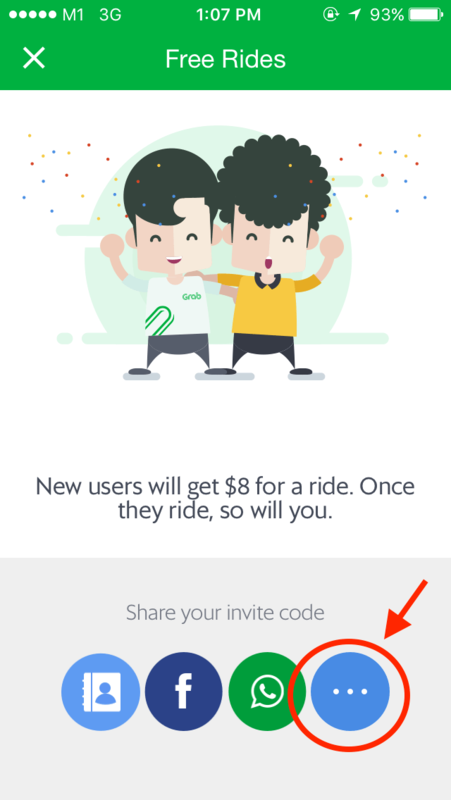 The alpha numeric characters circled in red after invite.grab.co/XXXXX is your unique referral code. Make sure you send ONLY the characters circled to your friend and make sure he uses that same code during the sign up process. 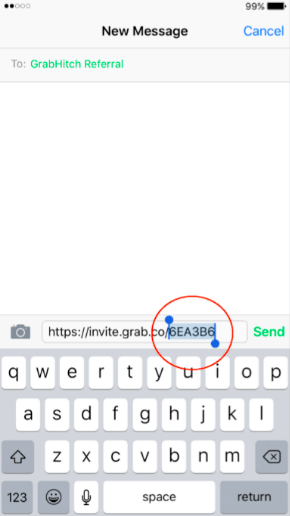 Paste the link in the text field. 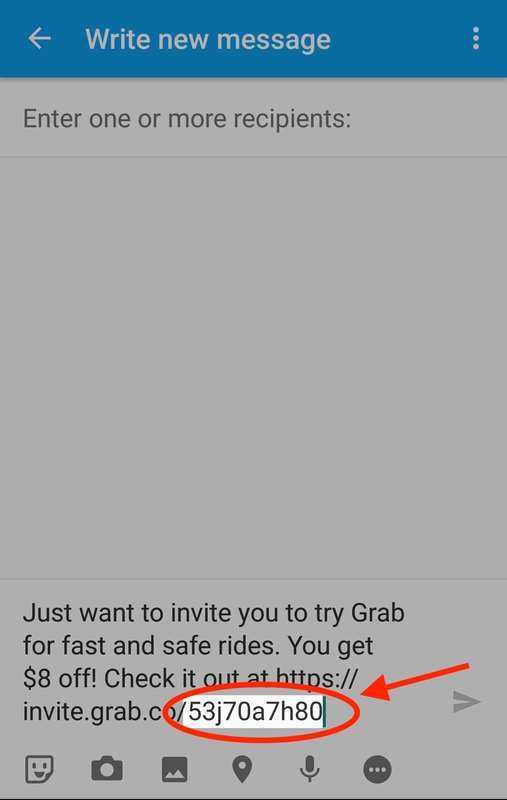 Send ONLY the alpha numeric code to your friend, and get your friend to sign up as a driver on GrabHitch. If you have questions do email us at grabhitch@grab.com and we will get back to you in 2-3 business days! The $20 credit for referrer / $20 credit for referred scheme runs from 1st December @ 00:00 hours – 31st December @ 12:00 hours. December BONUS: The cash bonus is exclusive to referrers only. December BONUS: Qualifying referrers are limited to one bonus only i.e. Referrers who have referred 8 friends will receive $50. 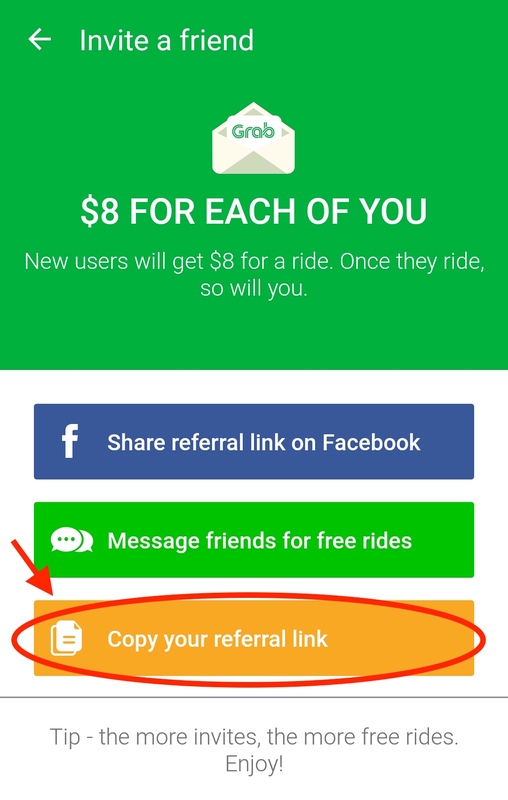 December BONUS: Referred friends have to complete their 1 ride before the incentive period ends to count as a successful referral. 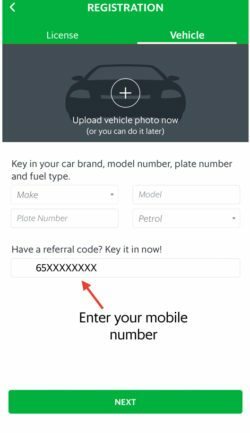 Only referrals who sign up with YOUR Grab-registered mobile number (include 65 in front e.g. 6512345678) or your unique referral code will be counted as a valid referral. After your friend has completed his/her ride as a driver, please allow up to 10 working days after the incentive period has ended (i.e. post-31 Dec) for your own credits to be processed into your GrabHitch driver wallet. You have to apply with a valid Hitch driver’s mobile number (65 plus his/her 8-digit mobile number) OR the driver’s unique referral code and do ONE successful GrabHitch ride as a driver by 31st December 12:00 hours to count as a successful referral for your friend. After completing your ONE GrabHitch ride within the incentive period, please allow up to 10 working days after the incentive period has ended (i.e. 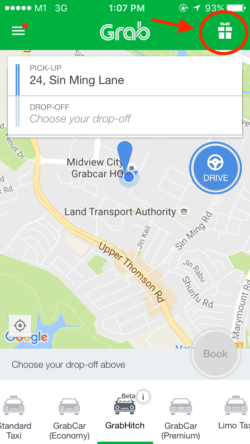 post-31 Dec) for the $20 credit to be processed and transferred into your GrabHitch driver wallet.